The Physical Security Products include a range of Burglar and Fire Resistant Safes, Strong Room Doors and Cabinets that provides utmost protection to your valuables. Now you can secure your important files and documents and be rest assured. Even crucial data and software stored on disks can be safely put away in Data Safes specially designed for the purpose. So when you leave your valuables behind, lock up your worries with them. Fully welded multi-corner bend construction with seamless body. A 83mm thick composite slab protection over entire lock case area of the door. Strong shooting bolts moving both ways. Thick outer shell for complete protection. Unique balanced pressure bolt work. High quality nitrocellulose paint for scratch-free and attractive finish. Also available, safes Listed at UL-USA, as per TL30 specifications. Available in Five classes in increasing degree of security from Class C to Class AAA specifications of BIS. Also available with a slab thickness up to - 175mm for high Security applications. Locking system Fitted with superior quality dual control high precision 8-lever locks. Excessive force on Handle Shears the Lever Control Bolt thus protecting the Vital Locking mechanism & Locks. 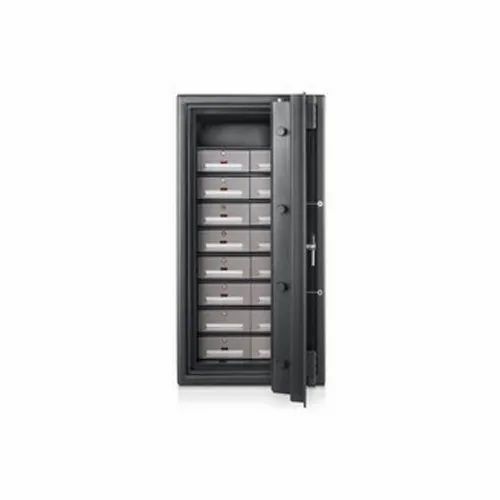 AccessoriesSafe with safe deposit locker.Additional drawers. Holder rods for suspending gold bags. Lockable hinged door to divide storage space. Founded in the year 1995, Premium Furniture is one of the eminent companies highly immersed in Wholesaling, Supplying, Distributing, Service Providing, Trading And Retailing a wide array of products comprising Office Furniture, Safes and Lockers and much more. We are leading service provider of Electronic Security Service and Currency Handling Solutions. These products are made up of the command of adroit personnel by making use of superior quality basic material along with futuristic techniques. In conformism with the principles and evolutions defined by the market, these provided products are enormously praised and applauded due to their effectiveness, fine finish, precise design, robustness, flawless finish and longer service life.